Love wings! You will love Wing Shack! A Northern Colorado restaurant specializing in mouthwatering chicken wing sauces and dry rubs, recently opened its 5th location in Fort Collins at 1011 S. Lemay, conveniently located right across from the Poudre Valley Hospital. Colorado-native, Brian Seifried and his team, have slowly moved throughout Northern Colorado. Loveland opened in 2006, West Greeley and Windsor in 2012. In 2014, they invested in a Food Truck which you can find rolling all over Northern Colorado, and just this past April 2016, Wing Shack debuted its 5th location in Fort Collins. Brian entered the restaurant industry the moment they would let him in, at the ripe age of 14. The early exposure to the operations and inner-workings of a restaurant coupled with a keen business acumen helped pave the way for him to enter the restaurant industry and spread the joy of the wing to as many people as possible. Brian attended CSU and then decided to open the original Wing Shack with his brother when he was 20 years old. He has always had a passion for food, growing up in a large family that would cook large meals together. Family has always been important to Brian as he is dedicated to his wife Jill and his two children Atlas and Indira. The Wing Shack prides itself on using the highest quality chicken. Wings are always fresh, never frozen, all natural andantibiotic free. The wings are always cooked to crisp perfection. Although their wings and sauces might have put them on the map, their menu variety keeps people flocking back. 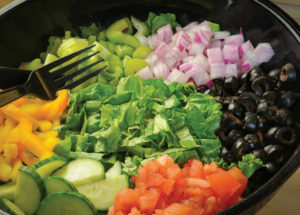 A ‘Create Your Own” option on the menu allows a customer to build a sandwich, salad, wrap, or fry bowl to their exact specifications. 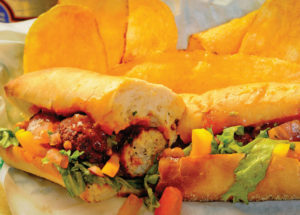 Recent delicious additions to the menu have been the yummy chicken bacon meatballs which are hand rolled and made fresh. If you are a fan of the potato, their menu has you covered, with the retro-inspired crinkle cut fry, the fresh made potato chip, the duality of the seasoned sweet potato tot , and the condiment friendly waffle fry! Everything on the menu is prepared fresh to order and their kitchens are a heat-lamp free environment. 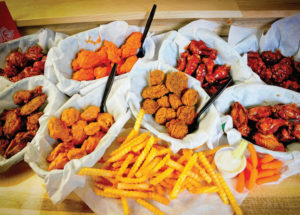 Wing Shack has been flavoring up parties and gatherings since it first opened its doors, whether it’s a family reunion or a bunch of friends getting together for the big game. If you want to keep your wings warm throughout your party, might I suggest asking for warming racks to keep your wings piping hot? And if you hate busy signals, don’t fret- you can order (or preorder) online at wingshackwings.com. Preordering wings during high volume days, such as Broncos games are highly suggested! 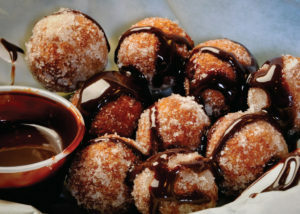 And if you want to cap off your meal with a sweet treat, you have to try the fresh melt-in-your mouth donut holes. Served with chocolate or strawberry dipping sauce, they are joined with the choice of two other decadent desserts- Snicker Crisps (chocolate, peanuts and caramel wrapped in a puff pastry, lightly fried) and Colorado-style Cheesecake (locally produced cheesecake, wrapped in a puff pastry, lightly fried. Each casual, family-friendly Wing Shack location has a unique feel to it. They are not a big-box restaurant where everyone looks the same. Each restaurant is a reflection of the people and culture that has made up the community. As avid Bronco’s fans, they have the game on at all their locations. Wings and beer, what a perfect combination! Beer is served at all five of the locations. With an emphasis on the Colorado Craft Brewing scene, you can enjoy rotating taps and a wide assortment of bottled beers. If you are more of a domestic beer drinker, Wing Shack also has you covered. All five locations are open for lunch and dinner daily. Fort Collins, Greeley and Garden City locations also specialize in late night eats and are open from 11am to midnight. Windsor and Loveland hours are 11am to 10pm daily. You can stay connected through Facebook or Instagram, or join the Wing Club at wingshackwings.com to be the first to know about events, specials and spicy deals!